The Dr. Bill Lewis Center is accredited by the National Children's Alliance (NCA). The NCA provides professional training, financial support, technical assistance, leadership, national advocacy and access to current research findings on child abuse and neglect to more than 700 Child Advocacy Centers across the nation. NCA also assists many developing centers, multi-disciplinary teams and child abuse professionals. The stringent standards set by NCA ensure children disclosing abuse are not further victimized by the system of intervention designed to protect them. NCA is the national authority on multi-disciplinary approaches to supporting child victims of abuse, and the organization works to empower local communities to provide comprehensive, coordinated and compassionate services to victims of child abuse. For more information on the Dr. Bill Lewis Center for Children, call or email Trish Fox at (260) 407-5437 or [email protected]. The Dr. Bill Lewis Center for Children is funded through a combination of private and corporate donations as well as state/federal reimbursement for services. Dr. Bill Lewis was a founding member of what originally was the Child Advocacy Center in Fort Wayne and which was renamed after him following his death in June 2009. William J. Lewis was born in Tacoma, WA., and raised in Palo Alto, CA. He was the co-founder, along with Dr. Hoffman, of the Parkview Hospital Neonatal Intensive Care Unit (NICU) in Fort Wayne, the region's first neonatal intensive care unit. 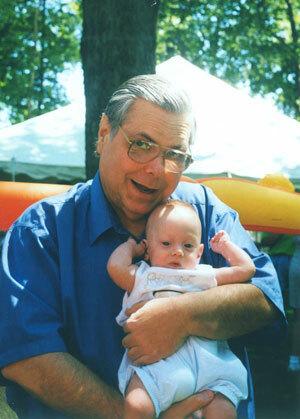 He was medical director of Parkview's NICU from 1979 to 2005, then served as director emeritus. He received a B.S. from Marquette University and his M.D. degree from Abraham Lincoln School of Medicine. He was a member of Alpha Omega Alpha while in medical school. He did his internship, residency and fellowship at Ohio State University's Children's Hospital in Columbus, OH. He was assistant professor of Pediatrics at OSU and later clinical assistant professor of pediatrics at Indiana University School of Medicine-Fort Wayne. For a time he also was on the faculty at the former Lutheran College of Health Professions and at Ivy Tech Fort Wayne. He was board certified in pediatrics by the American Board of Pediatrics and sub-board certified in neonatal/perinatal medicine. He had numerous articles published in medical journals and was a Fellow of the American Academy of Pediatrics, serving a leadership role in these sections: Neonatal-Perinatal Medicine, Child Abuse and Neglect; and Bioethics. His special medical interests were child abuse, apnea, SIDS, and neonatal respiratory disease. Other memberships included: the American Medical Association; Indiana State Medical Association; National Perinatal Association; Indiana Neonatal Association; Indiana Chapter of Prevent Child Abuse and Neglect; and the American Professional Society on the Abuse of Children. He served on numerous hospital committees and had staff privileges at four Fort Wayne Hospitals and at hospitals in surrounding communities. "The Most Selfless Individual I Ever Met"
"Good afternoon and thank you for joining us to celebrate the opening of the new Child Advocacy Center and its rededication in memory of Dr. Bill Lewis. Several months ago we moved into this location, which was graciously donated by Parkview Hospital. This space allows us to expand our services and better serve the children of our community. For those of you who are not familiar with our facility, Child Advocacy Center serves as a neutral child friendly place to conduct forensic interviews of children who are suspected to be victims of child sexual abuse. I would like to tell you a little bit about Dr. Bill Lewis and why we are renaming the Center in his honor. Dr. Bill Lewis came to Fort Wayne in the 1970s and was director of this community's first newborn intensive care unit at Parkview Hospital. The number of premature babies whose lives he has saved and enriched number in the thousands. You will see pictures on the walls inside our new Center, showing Dr. Lewis and his yearly reunion with all of the children whose lives he directly impacted. Shortly after he came to Fort Wayne he also began his lifelong dedication to helping medical, social service, and law enforcement personnel advocate for and protect the rights of children who were being abused and neglected. Bill Lewis was the most selfless individual I have ever met. Nothing was ever about him; it was always about the children. Bill served on numerous committees and boards of directors. He took it upon himself to become a medical expert in the area of abuse and neglect, all on his own time and using his own money. He helped me and countless other deputy prosecutors as an expert witness in criminal cases, and was always available to assist us in reviewing cases to determine if wrongdoing had occurred. Bill did this all on his own time and never once sent us a bill or asked to be compensated for his services. Dr. Lewis was a founding member of the Child Advocacy Center and served on its board of directors. I asked him several years ago if we could name the Center after him and after many long talks with him, he continued to refuse. He always wanted the Center to be about the children and the work we were doing, not about him, and he always preferred to be anonymous. After Bill died last June 9th, I asked his brother, Dr. David Lewis, about rededicating the Center in Bill's name, and he sent this response: ' was nice to meet you and thanks for the nice article that you wrote about Bill. He was a hero. But he didn't want to toot his own horn. It was never his style. Having said that, he mentioned to me a few months ago that someone had mentioned naming a child center of some type after him. He told me that he didn't want the program to use his name because he liked to do things anonymously. However, he wrestled with it because he felt his name might draw in more support because people knew him. He told me, " 'I just don't feel comfortable doing it. Maybe if I were dead.' "
Sadly, he is dead, but I think using his name now would not violate his will. Going ahead, using his name now would allow him to keep on helping the kids he wanted to help." After getting this response, our board of directors unanimously voted to rename the Child Advocacy Center in Dr. Bill Lewis' honor. At this time, I would like the board of directors and the staff to step forward. It is a great honor for me to unveil and dedicate the Child Advocacy Center to a man who dedicated his entire life to helping children. I hope that his memory serves as an inspiration to all of us to continue his dedication to volunteerism and to helping our community's children. With that, I now rededicate and rename the Child Advocacy Center, the Dr. Bill Lewis Center for Children."